Science is like a love affair with nature; an elusive, tantalising mistress. It has all the turbulence, twists and turns of romantic love, but that’s part of the game. I love the ocean, wide-open space and trees, but I’m not a gardener or anything like that. I think I may be, eventually. I was raised in the city, so I don’t have that skill set, but my heart is more with the dirt than the concrete. It’s an unrequited love with nature – a one-way love affair. 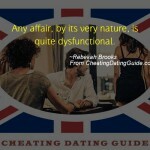 Any affair, by its very nature, is quite dysfunctional.